Family reunions can be rather awkward affairs. But these long-lost relatives were quick to break the ice in the warmest of ways – with a great big bear hug. 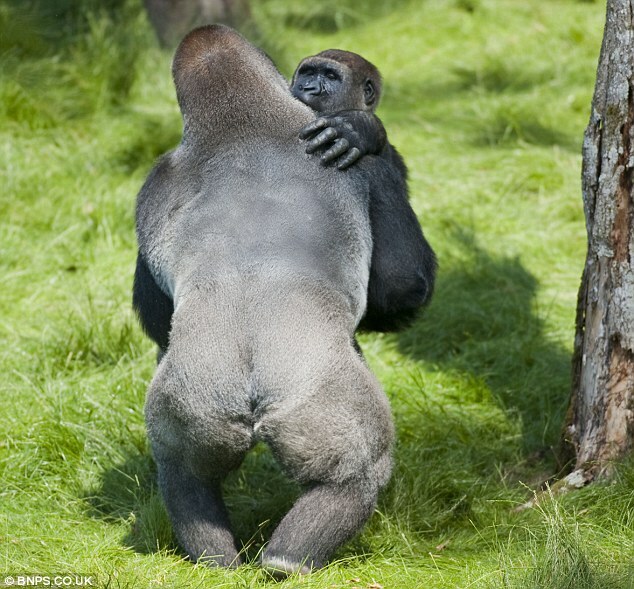 Kesho the gorilla and his younger brother Alf had been apart for nearly three years after being sent to different zoos. They were reunited this week in their new home in Longleat Safari Park and welcomed each other with open arms – followed by shoulder squeezes, handshakes and the odd bit of brotherly rough and tumble. The pair will now live together in a £3million enclosure at the Wiltshire park. 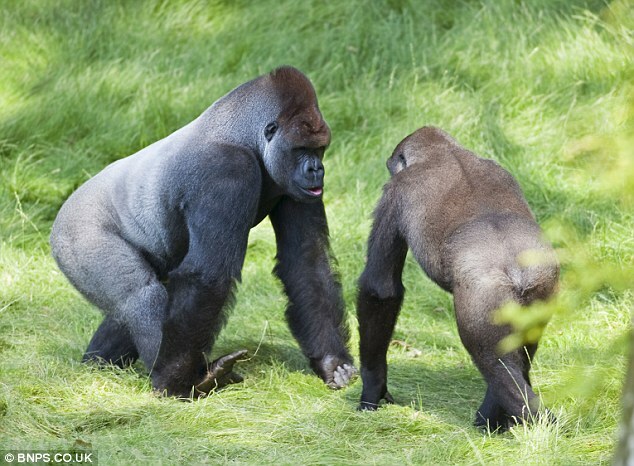 Born at Dublin Zoo, they were separated when Kesho, 13, was sent to London Zoo to take part in a breeding programme. He proved to be infertile, but while living with three females as the dominant male he became the leader of the pack – and transformed from a small blackback gorilla to a strapping great 35st silverback who towers over his nine-year-old brother. Fortunately, this wasn’t enough to stop Alf recognising him. 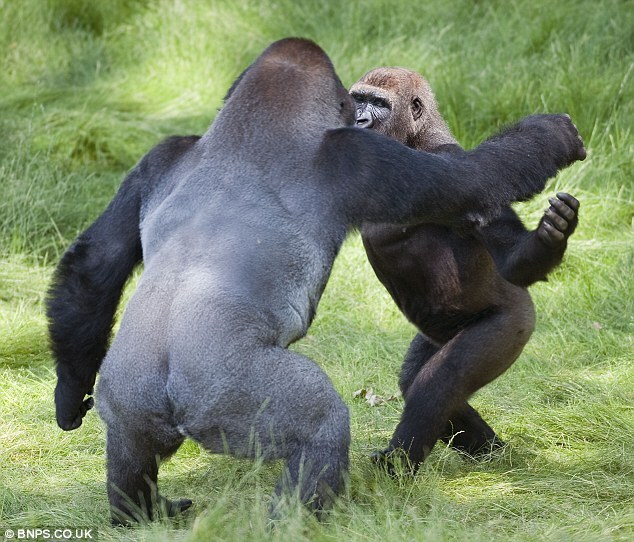 Gorillas, which share 98 per cent of their DNA with humans, can identify each other by the shape of their noses. 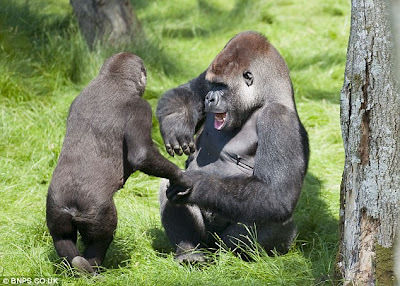 Mark Tye, head gorilla keeper at Longleat, said: 'We weren’t entirely sure that the brothers would even know each other, but the moment they met you could just see the recognition in their eyes. 'They were touching each other through the cage that temporarily separated them and there were no acts of aggression. 'We put them together 24 hours later and it was like they had never been apart. 'They were very animated and there was a lot of rough and tumble on the floor, but not in an aggressive way. Mr Tye said that Kesho was very tolerant and the gorillas had formed a 'really tight bond'. He added: 'Had they been two strangers there would have been a lot of face to face confrontation and some fighting and screaming. 'But Kesho and Alf were happy to turn their backs on one another which is a sign of trust. 'It is great for Alf to have an older brother to look up to and learn from and Kesho seems to enjoy being the centre of attention. 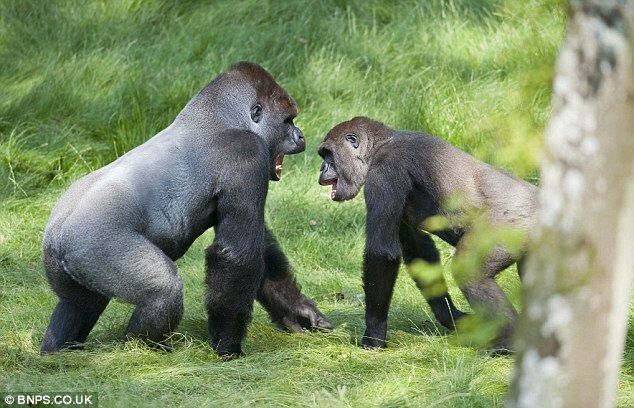 The brothers were born at Dublin Zoo but parted when Kesho joined three females in London. 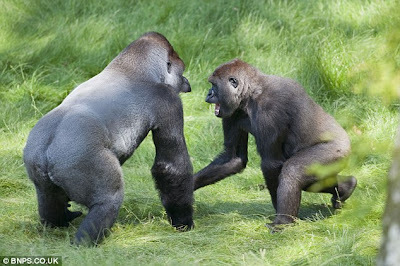 Longleat has set up a ‘bachelor group’ of gorillas as there are too many males in the European Association of Zoos and Aquaria breeding programme.